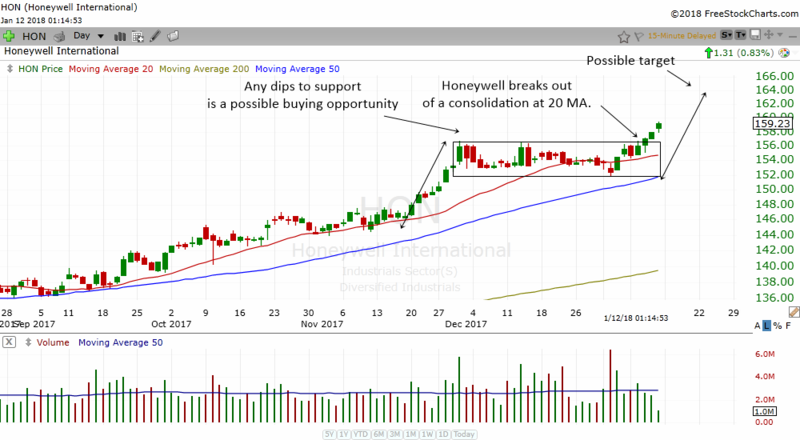 After a recent consolidation near the 20 MA, Honeywell's stock has finally broken out of the consolidation. A breakout of consolidation in an uptrend shows that the stock wants to go higher. Since HON is in an established uptrend, it is very likely that it will continue to move higher. With the stock staying above its rising daily 20 MA and 50 MA most of the time, we can consider this stock to be in a strong uptrend. A stock that is in an uptrend will usually continue to go higher. Consolidations are just periods of rest. A consolidation at the 20 MA can be tradeable and traders can buy the breakout with a stop below the lows of the consolidation box. We can often get a price target by taking the height of the previous move and then projecting it upwards from the base of the consolidation to get a realistic price target. If the move up is successful, it seems that Honeywell still has some way to go before it hits the target.